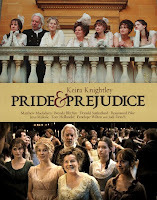 I've been listening to director Joe Wright's commentary while recently watching P&P movie (again) and I thought I'd post here some funny and interesting comments he made in his dvd commentary (as well as some P&P promo interviews he had done when the P&P movie was released back in 2005) of this film. JW was hilarious. - "I'm glad we made the movie for the people of Empire magazine, and not for the Seed of Chucky." - "Simon (aka Mr. Bingley) hasn't forgiven me for dying his hair red. But he should get over it, do you know what I mean?" heard that music, I just nearly wet myself." Check out these amazing P&P poster arts made by JW (aliwal) over at our P&P forum. 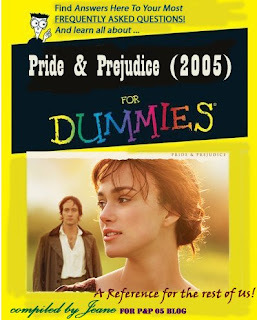 If you love P&P 05 film, feel free to use this beautiful poster arts to your site, myspace page, or blog, etc. Be sure to credit JW though as I think he deserved credits for making them. View 10 of JW's P&P poster arts below. Click the images to view bigger! You can find more of JW's P&P arts in our P&P forum. Speaking of my friend JW, check out his awesome Blog: Cinema La Mer Caramel, which he often blogs about his favorite movie stars and films, including P&P. Amazon.com now lists Atonement on DVD to be released on March 18, 2008! You can now start to Pre-Order it here!or Pre-order the download for $14.99 at the Amazon Unbox Video Download Store. Universal Studios Home Video have announced the US HD DVD release of Atonement on 18th March 2008 priced at $39.98 SRP. From Joe Wright, the director of “Pride & Prejudice”, comes “Atonement” - adapted from the best selling novel by Ian McEwan. A British story of romance, misconception, jealousy, guilt and justice, Atonement stars James McAvoy and Keira Knightley as a mixed-class couple whose love is doomed by a child's lie and World War II. The first 25 were already posted over a week ago. 5 More FAQ with Q&A are posted here.